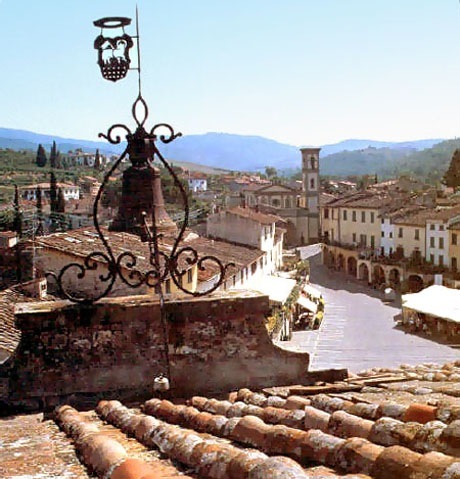 The charming medieval town of Greve is the unofficial capital of the Tuscan wine region. Lying in the very heart of the Chianti wine area, the surrounding landscape is considered one of the most beautiful in the country and quintessential Tuscany. Everywhere you will find a castle or wine cellar where you can stop and taste some of the local Chianti Classico accompanied by some of the excellent local bread and Pecorino sheep cheese. The wedding hall is housed in an imposing old Palazzo (palace) set in the heart of the town in the main square; a superb location. Civil ceremonies in Greve are celebrated in one of the main halls decorated with antiques. Couples wanting to hold a Catholic marriage in Greve can choose from several charming churches. Many predate medieval times and are solemn and beautiful. Wedding receptions in Greve offer an incredible variety of options from medieval castles to charming Tuscan inns to panoramic villas with gardens; in short, whatever your budget if you want to offer your guests a taste of authentic Tuscany you should not hesitate to pick Greve for your wedding in Tuscany.